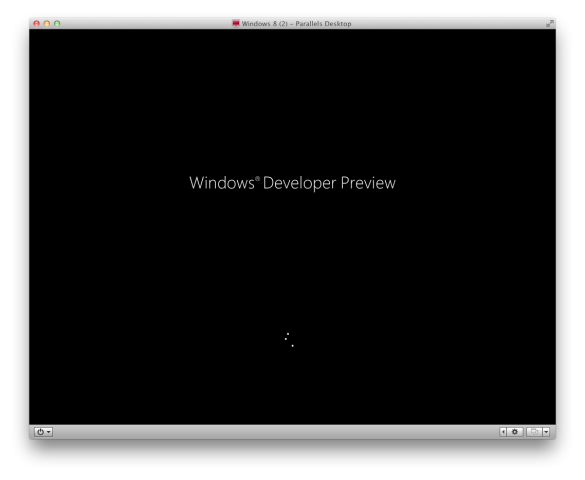 As you will no doubt be aware, the developer preview of Windows 8 has docked and is ready for unloading onto your machine. You’ll most likely want to get cracking and take a look at what’s on offer first hand before we reveal our comprehensive guide. 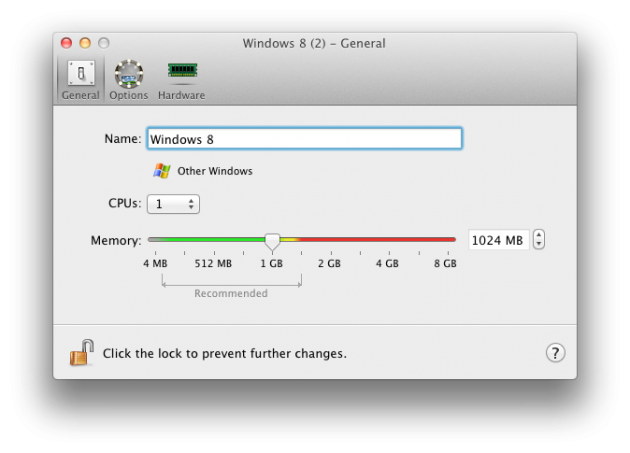 But, if you’re using a Mac, you might want to stop, pause for thought, and read this little piece on how to virtualize the latest build of Windows with Parallels, and just why it’s a good idea. Obviously this early developer preview (Build 8106) is still at a relatively early stage of development; therefore it’s likely that it’s not going to be issue and hassle-free. As you’re more than likely just going to be ‘playing’ with it, rather than using it in any sort of productive capacity, running within a virtual machine (VM) makes it easy to simply quit, restart or reinstall with minimal damage. 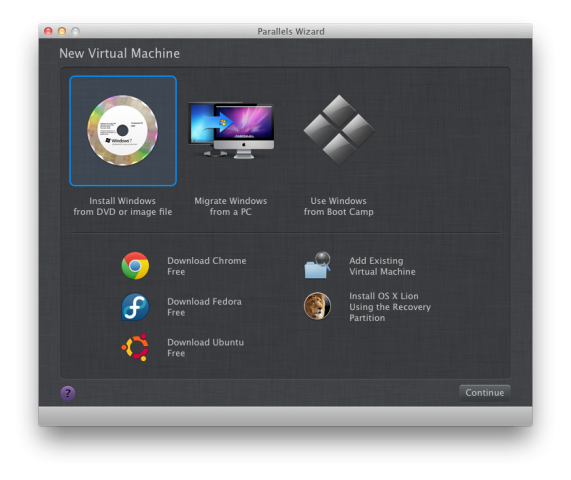 Using Parallels, you can run the virtualised OS alongside Mac OS X, and if you’re running Lion with the latest version of the virtualisation software, you can make use of the ‘full screen’ feature, and have Windows 8 running as no more than its own app in Mission Control. There are only a couple of reasons that spring to mind which would justify installing this version of Windows 8 clean as the primary OS, or even within a dual-boot, and that is if you’re perhaps running an older machine, with relatively low specs. Virtualization can be quite resource intensive, and requires dedicated allocation of perhaps 1 or 2 cores of your CPU and a couple of gigs of memory, thus deducting it from your primary OS and slowing both down to near-halt. Alternatively, you might just have a spare computer lying around redundant, in which case you might want to get it out and update it with a brand-spanking new OS. Well of course you will first need to install Parallels, which will set you back a fairly hefty £64.99, unless you previously owned a copy of version 5 or later, in which case you’ll only have to fork out £34.99 to upgrade. Instead you might consider making use of the free two-week trial that is ample time to get familiar with a new OS, which you’ll likely ditch through frustration or a lack of necessity after the novelty wears off anyway. The trial is fully-featured. 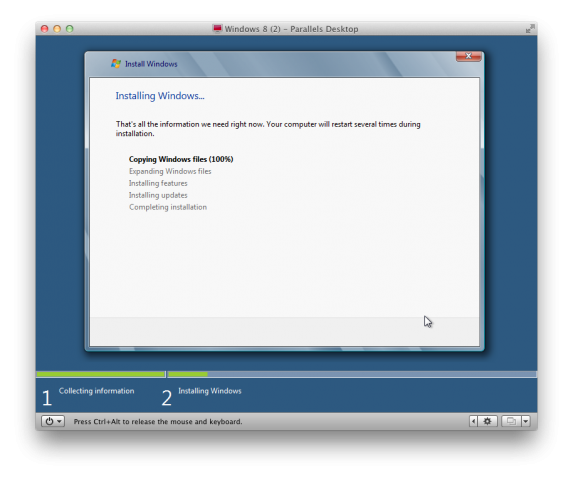 Once it’s downloaded and installed, you’ll need to download your free copy of the Windows 8 developer preview. You’ll need to hit the highlighted option on the left hand end, labelled ‘Install Windows from DVD or Image File’. Here you have a choice. Either you can simply go through and select the .ISO file containing Windows 8 that you downloaded earlier that is stored locally, or you can burn said .iSO to a DVD, insert that and be on your way that way via your DVD drive. It’s entirely up to you, though read speeds from your HDD are considerably faster than those of a DVD, so it might shave a few seconds off installation taking the former route. If you decide to burn the DVD, you can simply proceed past this step as the DVD drive is the default location that Parallels looks at when looking for an OS to install, so just hit continue. Otherwise, hit the drop down menu, and select ‘Choose an image file…’, and locate it through Finder as per usual. As you get past this step, you’ll find that you receive an error message saying that Parallels couldn’t automatically detect which version of Windows resides on the disc. Hardly surprising, considering it was uploaded just last night to MSDN, and isn’t commercially available yet. This is important . For the installation and Windows to work correctly, you must select ‘Other Windows’ from the drop down it provides, which is hiding with in the ‘More Windows’ sub-menu. Once you’ve established that the version of Windows you’re trying to install doesn’t exist, you will be faced with another potentially critical part of the journey. Of course, naming your OS and deciding where to locate the virtual OS on your local drive is important, but more often that not will survive as it is without any tampering. 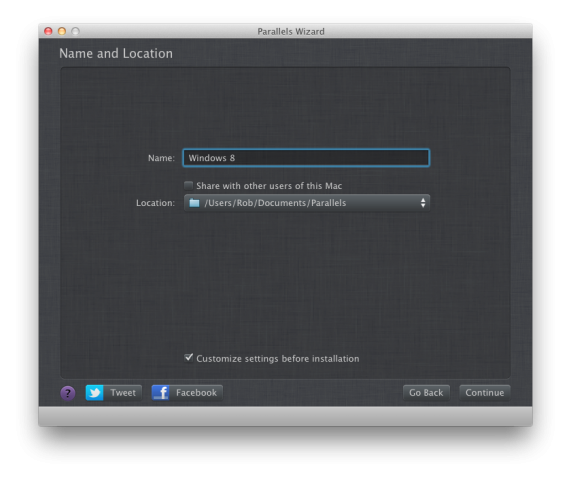 But feel free to call it ‘Windows 8’, rather than the rather conspicuous ‘Other Windows’. If you do select the box, you’ll be taken to a tabbed pane with various options. First of all, you’ll want to decide how many cores you want to allocate your VM. Bear in mind that however many you do, will be deducted from the rest of your machine whenever the VM is in use, so you will notice a hit on performance. I personally decided on allocating half of my cores to Windows for this exercise, but depending on how many you have, this might not be the best option. Stick with 1 or 2 I think for now, unless you’re going to be demanding heavy-duty tasks from such an early build of Windows. Secondly, you have RAM. Now Parallels tells me that allocating 2GB is beyond the realms of sanity, and I should be mad to even consider it (highlighting it with a red indicator), but I went for it anyway, and again gave away half of my power to Microsoft. You can do as you wish, but I’d recommend no less than 1GB. Just use the slider to take it up or down to the point at which you’re content with the juice you’re giving Windows. There’s also a ‘hardware’ tab, you’ll notice. From here you can manage the more complex aspects of your VM, such as your network setup and how the VM can work with USB ports and optical drives. For the average user, what’s there as default will do nicely, but anyone wishing to venture into the depths of the virtual world does so at their own risk. By default, the virtual hard drive given to the virtual machine, for me at least, starts at 64GB, but should you use that space up (unlikely), it naturally expands, eroding away at the remaining capacity of your actual hard drive, predictably. 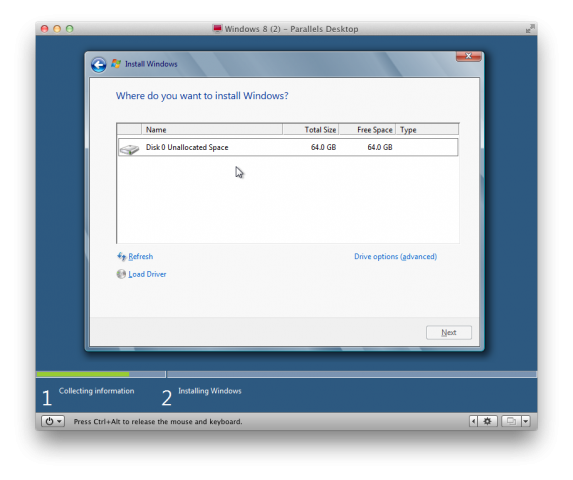 Once that’s achieved, you’re all set to install Windows 8 on your VM. You’re primed and ready, as they say, so set sail and don’t look back. Hitting continue from the spec sheet will bring up a screen familiar to anyone who’s ever installed Vista or Windows 7. And one not so familiar screen. From there, you will face the relatively simple task of deciding where to install the OS. Since there should only be a single, virtual, partition, just select that as below and be on your way. Go and make yourself a cup of coffee, wait for the OS to install of its own accord, and you’re all set. You can opt to reboot the VM as you would if you had installed it clean, or just get underway as you are. Good luck.